The Kansas City Chiefs sealed their second-straight AFC West title by defeating the Miami Dolphins in Arrowhead Stadium. QB Jay Cutler was 19-of-38 for 286 yards and a touchdown and did not have a turnover on the day. RB Kenyan Drake had 57 yards on 13 carries, but the biggest statistical contributor for the Dolphins was WR Jakeem Grant, who had 107 yards receiving on four catches and caught Cutler’s touchdown pass. QB Alex Smith was 25-of-39 for 304 yards and threw a touchdown pass to TE Travis Kelce, who had 47 receiving yards in the game. RB Kareem Hunt had 91 yards on 29 carries and also scored a touchdown that helped extend the Chiefs’ second quarter lead. Chiefs kicker Harrison Butker was heavily-utilized, as he was 5-of-6 on his field goal attempts. With that, we give you our PFF-exclusive takeaways from the contest for each team. 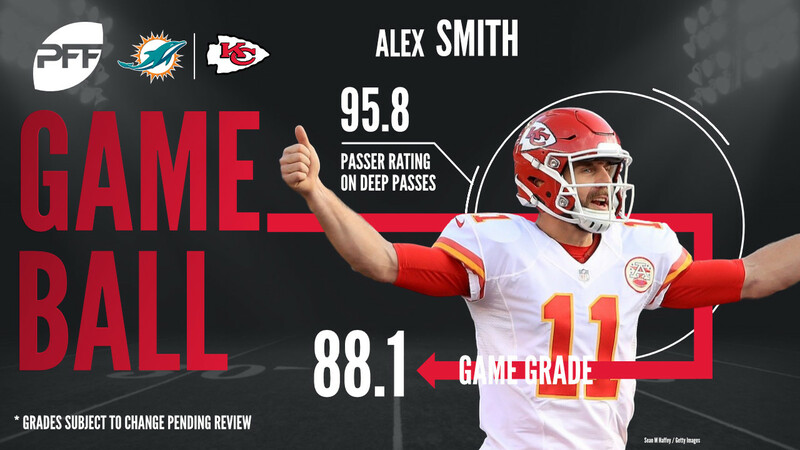 Smith killed it on deep passes, just like he has done all year. He completed three of six deep targets (20-plus yards downfield) for 120 yards. However, he also had two more good throws that should have been caught; a perfectly-thrown seam pass to Albert Wilson that was dropped, and a ball thrown to Travis Kelce who lost control of it as he hit the ground. Hill caught six of seven targets for 109 yards, including a 52-yard reception, his sixth 50-plus yard reception of the year. He has 13 deep receptions thus far. His only incomplete target was his acrobatic catch in the end zone that looked good, but was ruled incomplete by the refs even after review. No surprise that Peters was stingy in coverage again, as he was targeted eight times, allowing only two receptions for 39 yards. He posted the best coverage grade among the Chiefs’ secondary. Peters has shown a knack for forcing fumbles too and was able to strip Kenny Stills, leading to a turnover for his defense. Johnson did drop drop a late game intercpetion but was the highest-graded coverage defender on defense with a grade of 87.2. Johnson has been very good against the pass throughout his career and this season is no different. He allowed 56 percent of the passes his way to be caught and tallied four pass break ups. Grant was electric with the ball in his hands against the Chiefs, he was targeted six times and caught four of them totaling 107 yards. He broke three tackles on his way to a 65-yard touchdown on a screen pass in the first half but saw limited playing time in the second, totaling only 11 snaps in the game. Grant has only played in 10.4 percent of Miami’s offensive snaps this year. Drake wasn’t able to get as many touches in the ground game like prior weeks due to Miami falling behind. He ran the ball 13 times for 57 yards and was able to force four missed tackles. Drake has been one of the most elusive running backs in the NFL the last four weeks, forcing 17 missed tackles in that span. Tackles don’t always mean much without context, but Reshad Jones was all over the place making plays for the Miami defense. Jones had six defensive stops for his second-most in a single game in his career (eight in Week 11, 2012). All six came in run defense, including back-to-back stops on third and one and fourth and one. In coverage, Jones allowed three catches for 40 yards, including a touchdown, but also broke up a pass as well. It was a rough outing for McCain, who allowed nine catches on 12 targets for a career-high 99 yards allowed. Three of those catches resulted in defensive stops, but he still allowed far too many plays elsewhere. Of the three incomplete passes thrown his way, two were dropped by the receiver.